The international Cassini-Huygens Mission is a joint mission of the National Aeronautics and Space Administration and the European Space Agency, with the Italian Space Agency as a major partner. The spacecraft was launched from Cape Canaveral, Florida, on October 15, 1997, and was inserted into orbit around the planet Saturn on July 1, 2004. The Huygens Probe separated from the Cassini Orbiter on December 26, 2004 and coasted to a descent by parachute through the atmosphere of Titan to the surface on January 14, 2005. This chapter summarizes the primary science results to date from both the orbiter and the probe. Many of the analyses are preliminary in nature, and some may be revised as additional data enables better characterization of Saturn and its system of rings, magnetosphere and satellites. 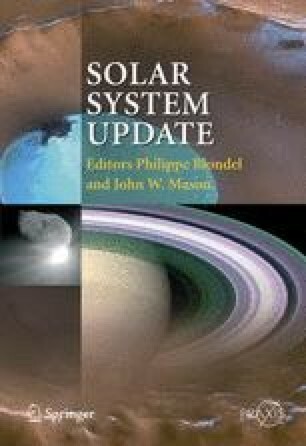 The initial results summarized in this chapter include images and other data from a close encounter of Phoebe prior to Saturn orbit insertion, from ring studies and magnetospheric studies during orbit insertion and the first year in orbit, from studies of Titan during the first several flybys and from the Huygens Probe mission, and from close flybys of several of Saturn’s icy satellites. The results also include discovery of several new satellites and a new radiation belt between the rings and Saturn’s atmosphere.